Home Menu Course Appetizer THE PERFECT WAY TO PIG OUT ON SUPER SUNDAY! The Anchor Bar in Buffalo, New York. 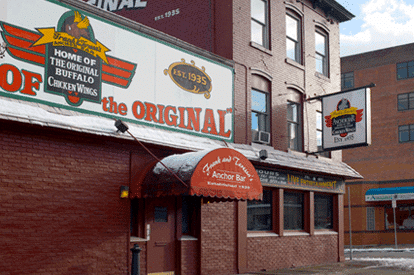 The original Buffalo wings were invented at the Anchor Bar in Buffalo, New York in 1964. They are the perfect low-carb snack for Super Sunday. To turn them into a meal, use drumsticks instead of wings. To super-size your snacks, use turkey wings! Heat oil in a deep fryer or skillet to 370 degrees F. Blot the wings dry, sprinkle with salt, but do not use flour. Fry, in several batches, for 10 to 12 minutes or until golden brown and crisp. Drain on paper towels. Melt butter and stir in the hot sauce. Dip the wings in the mixture. Arrange on a platter and serve hot with celery sticks and Bleu Cheese Dressing (below) for dipping. Makes 20 to 25 servings. Makes 8 servings of 2 tablespoons. Coat wings with oil and bake in preheated oven set at 400 degrees F for 45 minutes to an hour or until brown. Turn after first 20 minutes. Blue Cheese, Dip, Dressing, Wings. Bookmark.